I'm going to introduce podcasting via talking about its history, and work through what a podcast actually is. Then I'll talk about our experience podcasting WE05, both from a practical and a business point of view. The overarching theme of this presentation will be podcasting from the broadcaster's point of view. For info about podcasting from the listener's point of view, check this page here. To give a one sentence description, podcasting is a method of publishing audio and video programs via the internet which allows users to subscribe to a feed of new files. Now, there's only one part of that sentence that is actually exciting, and interestingly it has nothing to do with Ipods or broadcasting, the presumed etymology of the word. The only exciting part as I see it is "subscribe". And if we talk through the brief history of podcasting, we'll see that this is what drove the development. By 2003 various digital audio players had been on the market for around 5 years. Most importantly, for the last two years a little product from Apple called the Ipod had slowly but surely been turning into the 10 000 pound gorilla of this market. Just to explain though, I don't want anyone to go away from here thinking that podcasting is in any way inherently connected to Apple or Ipods. No one's really sure how the term came to be used at all. And the term audioblogging is in fact much more accurate, because podcasting need not involve an Ipod in any way, and nor is it actually a broadcasting process, as the audio file is simply posted by its publisher, then pulled down from that location by the person who listens to it. Getting back to 2003, at the same time blogs had pretty much come into their own, at least within the rarified world of the web savvy. Instead of going to a web browser every morning and working through a series of bookmarks to see if there was any new content, we could just sit down in front of an RSS reader like NetNewsWire or FeedDemon and have it tell us what was new. Bloggers often published mp3 audio content as part of the content of the blog post, but there was no way for it to be delivered with the RSS feed. But audio and video were simply "not working" on the web, I think because the wait required in order to experience the content was never justified by the quality of that content. You had to click, wait wait wait.......often wait for longer than the content itself would play for. And then it's quality was so low, in an attempt to keep that time you waited to some sort of minimum. The genius of Adam Curry, who had a background in television and a determination to make video content work on the web, and Dave Winer, whose company were the creators of a blogging tool called Radio Userland, and more importantly, the RSS specification, was to think of a way that you could have your computer do that downloading not just in the background, but, without you even having to tell it to do so, at a time when you didn't even notice it. Subscription and then background delivery of content as it becomes available is much more engaging and seductive than seeking out that content, waiting for it to download and then enjoying it. It's kind of like just opening the door every morning and finding the newspaper sitting on the doorstep, as opposed to having to sit at the window at a certain specified time of day and watch the newspaper boy rumble his way down the street in order to be able to read the newspaper. The solution they came up with was the addition of the enclosure element to an RSS feed. As simple as that. So, the second version of the RSS spec, RSS 2, allowed you to do this. Then all you needed was to incorporate the ability to subscribe to an RSS feed into the software used to listen to audio content and the circle would be complete. I went from complete novice to writing and putting up my own site in less than a week. Let's have a quick look then at what the RSS code actually looks like. The point is just to see how simple the code actually is. Later on, when I talk about rolling your own podcast, I'll go through some of the tools you can use to do this. This is just the easiest way to demonstrate, without using any one tool, what the required fields are, and what they might look like at the user's end. For more detailed info about these and other elements you can include in an RSS feed, check out the RSS Specification. Here's what you need to create your RSS feed itself. Think of this as being like a channel (thus the name of the element, as you'll see) as in television channel, and then each of the individual podcasts within this channel are like individual programs broadcast on a television channel. There's a whole lot of other things you can put in here that allow you to do all sorts of things like tell a feed reader to skip certain days, the language used in the feed, copyright information relating to the feed as a whole and so on. The above two are just those which are required for validity. And then you must have at least one valid item entry which will contain the enclosure for your podcast. All elements contained by an item are optional, though it must contain either a <title> or a <description>. The following are not necessary, but you'll find most tools want to include them. This should conform to RFC2822. A global unique identifier, that should never change for this particular podcast. With the URL being, obviously, the location of the mp3, the length being the size of the mp3 (in bytes) and then the MIME type of the file. Now, just in terms of satisfying the specification, that's all you need. But, remember I mentioned the 10 000 pound gorilla of the mp3 player world? Well, that was the Ipod, but how do you get content onto your Ipod? You synche it with your Itunes on your regular computer. When Apple released iTunes 4.9 they included support for downloading podcasts. At the same time, they released a set of extensions for RSS that affects how podcasts will appear in iTunes, and in the Itunes music store. How Apple created these extensions was by creating an xml namespace. I'm not going to delve into xml namespaces here: suffice to say that this means you can add in a whole heap more elements that aren't in the main RSS specification, and these elements get used by iTunes to populate a whole heap of fields and columns and so on. My understanding is even if you include none of the following, your podcast is still going to show up in Itunes, it's just that all this additional information won't be there, so your podcast will look a little odd. Again, most tools help you make sure you include all these things automagically. First, you'll also need to add the following namespace declaration. Then you can add the following fields. I'm just going to point out a couple of the more basic ones. There are in fact heaps that get used for all manner of things in Itunes, you can choose to specify them if you wish. Will appear in the Artist column. The contents of this are shown in a separate window that appears when the Info Button (circled i) in the Description column is clicked. It also appears on the iTunes Music Store page for your podcast. This field can be up to 4000 characters. The contents of this is shown in the Description column in iTunes. It looks best if it is only a few words long. Use this or your summary/description will get used in the Description column in iTunes: almost certainly way too long. Now all you have to do is publish this by transferring your podcast RSS file, and your audio file, to your web server. Now, when someone comes along and subscribes to your RSS feed, if they've done so using a piece of software that supports podcasting, then it will be sucked in just like any other item in the feed, and ready to be played. Couple of things podcasting is not. It's not streaming audio. Well, der, but, why's it different and better than streaming audio? Because of the subscription and background downloading model. Once you've subscribed to a podcast, that's all you ever have to do, from then on the content just gets delivered to you, and you can choose to listen to it whenever you want. And, more importantly, it's not to be confused with just posting an mp3 file at your site. Though, having said that, you can certainly be forgiven for doing this as well as posting them to your RSS feed, as an alternative method of ensuring that newbies actually do manage to get the content. This is what we did with WE05. But, why's it different and better than this? Again, you get to time shift. Once you've subscribed, the content is yours as it becomes available, to listen to whenever you please. I'm going to talk now about the technical details of creating your audio file and turning it into a podcast. As I said, I'm doing this on top of my experience with podcasting our conference a couple of months back, WE05, but I've tried to extend what I say so it has broader relevance to anyone who might want to podcast anything, anywhere. Some ideas for things that it might be interesting to podcast. OK, as I brushed over before, to create a podcast you need to create an mp3 file, and publish it as an enclosure in an RSS feed. But there's still a lot you can do with much less sophisticated technology than we had at WE05. As long as you follow a few basic rules, you will get a product that is more than adequate. Then it's up to you to provide engaging content within the podcast itself, which is of course, what drives the success of any web project. Recorded onto a dedicated sound recording device such as a minidisc. Why? Because dedicated devices are always going to be more reliable. Computers, software etc, as we all know, crash and drop out for reasons you'll never fathom, at times you least want them to. Minidiscs on the other hand are pretty simple, tested technology that aren't going to let you down. A good option is the Edirol, with which you can create the MP3 file on the fly, ready for immediate upload. Had a backup. Again, ideally, we would have set the desk up so there were two lines out, one to a laptop and one to a minidisc. Belt and braces. You can't go wrong. Did anything go wrong? Yes, of the 15 sessions that we recorded, 3 of them inexplicably dropped out half way through. We haven't been able to establish for certain what went wrong, but the consensus is this was caused by GarageBand, the software we used to record on the laptop. As you can imagine, it's a pretty memory hungry application. If I was forced to use this method of recording again, I'd certainly make sure it was the only application running on the laptop, and that it never worked in the background. A different situation is what we have here at a presentation like this, in a small setting where speakers don't use a microphone. Now, you can try recording straight onto your laptop hard disk, but I think you're going to have trouble making it work, because the signal between the speaker and the laptop just isn't going to be strong enough, more or less no matter what you do. Better is to get one of these little devices like I have here, with a simple lapel mike going straight into a minidisc. Now, having said all that, you can do something a bit more basic if you're not actually recording a presentation. If you're just recording yourself, or someone else speaking, because, well, you've got something to say and you want the whole world to hear it, all you need to do is get yourself a microphone (anywhere between $5 and $500 - and you get what you pay for), and a set of headphones, so you can hear the audio file as it is created without getting feedback, plug these into your computer, and you're good to go. Now, this really just comes back to our particular situation with WE05. Cabling is always a pain, you just need to check it out on a case by case basis, but my point is, don't neglect to do it. All this is about is being sure that if you're recording something that is coming through a mixing desk, do make sure you get in there beforehand and check out what sort of cabling you are going to need to go between the mixing desk and the laptop or minidisc, because there are so many possibilities here. And if you haven't checked this out, guaranteed you will get there on the day and not have the right cabling. You need software which is going to do four separate things here. Different software can do different parts of this process. Again, I'm just going to talk about what we did. We used GarageBand and Itunes on the Mac to record and mix down. Another option is Audacity, which is free, open source, and cross platform, and also comes highly recommended. Is really straightforward, however, there are a couple of gotchas, mainly to do with making sure you've got the levels coming in right. You need to control the levels of the sound as it is coming in the System Preferences (Sound, Input, Internal Microphone), rather than in GarageBand itself. That little equalizer you see near the track in GarageBand, and the control below it, is only showing (and controlling) the playback levels. Keep an eye on this throughout the whole recording process. For a clear, full sound, the volume levels should occasionally peak into the red but usually remain in the green and yellow areas. We had the issue that from time to time sound would be coming into the mixing desk via three different microphones (lapel, podium and handheld), which each seemed to have different base levels, so we had to quickly had to adjust this master volume to compensate. Also watch the levels as they are appearing in the track mixer while you are recording. You should see a good strong signal with lots of peaks and troughs. This is basically showing that you have a difference between your signal and your noise, which makes it easier for you to try and get rid of noise later on if you have to. If you've got a really weak signal coming in without such strong peaks and troughs, it is really hard to clean that stuff out. Now, we didn't actually do this, because to us making the podcasts available as immediately as possible after the event was important enough to justify us compromising on quality. However, if you've got the software like Adobe Audition to do this then by all means go ahead and clean up things like high end hiss and other irritating noise on the recording. Rule 1: record at the best possible level and mix down. Yes, sure, you are ultimately going to podcast something which is only 16 kbps, in mono. But record and archive at 192 kbps in stereo, because you just never know what you are going to want to use something for in the future. We actually recorded in mono. 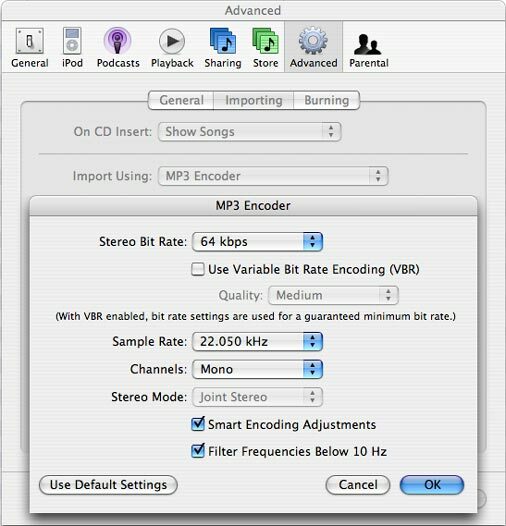 However, if you can record in stereo and then mix down to mono later in Itunes for your final mp3, but save your master in stereo in an uncompressed format, this is much better. Only because you never know what purpose you may ultimately wish to use something for, and if you've kept a high quality back up, then your options remain open. Rule 2: when trying to maximize sound quality boost close to the source. get the person to speak up! And there's probably other points in that chain as well, but already, once you're trying to boost the signal, if it is coming out of the person who is speaking weakly, there's only so much you're going to be able to do. So, as I said, start close to the source. GarageBand works and saves everything in AIFF, which is an uncompressed, high quality format. So, as I said, you'll want to save your archive version in this format, but for your podcast you'll want to save as an mp3. Effectively we did this by exporting to iTunes. It's just a menu item in GarageBand. Just be aware that GarageBand can take quite some time to complete this exporting process. In GarageBand, in the File menu choose Export to Itunes. Once the export process is complete Itunes opens automatically. The file is still currently in AIFF format. You've got to set up the importing: this is where you actually reduce the file size, which, I might add at this stage, is a very large concern. For example, if you create an hour of content at 192 kbps you're going to have a 100 MB file, which is way too big. We went for 64 kbps, which I think was fine in terms of quality, and meant we could get the file size down to about 14 MB for an hour of content, which is acceptable. Your mileage may vary, it all depends on your content, you'll have to experiment. We set the compression to 64 kbps and the sample rate to 22.050kHz. MP3 is a lossy compression method: some information has to be lost, it's a matter of deciding how much, and from where. Now, both compression and sample rate will have an effect on file size, as well as sound quality. To really understand what you're doing with these take a few minutes to learn about both of them. This is a very comprehensive article here. We also set the channels to Mono. Now, back in the main Itunes windows, select the file and choose Convert Selection to MP3 from the Advanced menu. You'll end up with 2 files, the AIFF and the mp3. From the File menu choose Show Song File to find your mp3 in the Finder and you're done. As I said in the section before, podcasting works by adding an <enclosure> element to a standard RSS feed, and I took you through what the actual code was. Of course, no one does this by hand coding, so here's a few tools you can use to create an RSS feed with an <enclosure> element, ie a podcast. It's a pretty fundamental feature of any blogging tool that as well as posting your blog posts, it also generates an RSS feed. So, the simplest way to create podcasts is to work out how your blogging tool of choice allows you to add an enclosure. One thing I would do is make sure that the tool allows you to add all those extra elements I referred to previously that make your podcast play nicely with Itunes and Ipods. You can even use a really basic blogging tool like Blogger, in combination with FeedBurner, to create the Podcast. Feedburner will turn any audio files linked in a blog post into an enclosure in the RSS feed. These instructions start from the beginning with setting up a Blogger blog. A little over half way down they show you how to work with FeedBurner to use that blog to podcast. Which are kind of like using Typepad, but rather than creating a blog you're creating a podcast. You do have to be really really careful about bandwidth because you can very easily be a victim of your own success here if you haven't sorted out a hosting arrangement that isn't going to punish you if you get a lot of traffic. It's one thing to exceed your bandwidth when you're talking about the relatively small files involved in a regular web site. It's quite another thing when you see how quickly you can go way beyond it when you're talking about files 15 MB in size, every time someone hits your podcast. So, do the numbers and sort it out with your hosts before you get started. Just by way of example, we had close enough to 60 000 mp3 files downloaded in 5 weeks, representing 271 GB of traffic. You might want to think about using someone like OurMedia, who provide free storage and bandwidth. No catches. Forever. They are a grassroots media organisation with an interest in encouraging grass roots publishing such as podcasts. All of whom are budget priced hosts specialized in hosting podcasts. Liberated Syndication comes particularly recommended. At least at the time of writing they were not charging for bandwidth with respect to downloads, only disk space. You can also use them just for hosting the MP3 file, and use any other service you like, as talked about above, to create the actual podcast. Podcasting: so much hot air? The wisdom is that you know you've made it when people start saying your product or technology is all hype. If this is true then podcasting probably made it in around March 2005, when I first heard that comment made about it. Since then of course, plenty of discussions have done the rounds, but I think the consensus is the jury is still out. Really all I can talk about here with any authority is our experience with WE05. Apart from that I have to leave it up to you to decide if this is a style of content it's going to benefit your business or organisation to create. As a bare fact, we got 60 000 individual downloads of podcasts in the 5 weeks after the conference. Which all sounds very impressive but, what can we expect that traffic to translate into? We put on a conference that focusses on the latest techniques and thinking in web development. Podcasting is a new technique, and it's also something that people have been doing a lot of thinking about of late. It was our opinion that if it was financially/technically feasible for us to podcast our sessions, and see what comes of that, then we really had to do it to maintain our credibility as Web 2.0 boosters. If you share the love, people will love you, it's as simple as that. Give people something to talk about and they will talk about you. If you go and do a Technorati search for WE05 and podcasting you'll see all the great things people wrote about us without us having to pay them to do it. A lot of attendees were probably going to write about WE05 anyway, but this gave people who weren't even there something to talk about and link to. In the days after the conference we saw many many blog posts from people all over the world, who had no means to get to Sydney Australia, saying how much they had appreciated almost being able to be there by listening to our podcasts. It's what the web can be all about. Our conference was sold out this year. A month before, you couldn't have got a ticket from us no matter how much money you were willing to give us. So, in that circumstance we saw no reason why not to share this wonderful resource with those people who are just never going to be able to make it. From a hardnosed point of view though, you do ultimately want this to translate into ticket sales the following year. Will it? On the one hand I think there is a certain type of person who will choose not to buy a ticket if they know the event is going to be podcast. And this might be for any number of reasons, but ultimately they're all financial at heart. What you need to do is use the podcast as the opportunity to convince people that the difference between what they get out of sitting at home listening to the podcast and what they get out of coming along is justified by the expense. People are downloading your ads when they listen to your podcast, so make sure you take every opportunity to let them know who you are. Make sure you brand your podcasts properly. Place some audio at the begining and end of the podcast which lets people know what this is and where it comes from, including, if possible a pithy URL. Get all the labels right which control how your podcast shows up in the software people will use to listen to it. Pay special attention to Itunes here, only because there are in fact lots of neat things you can do to make your product look really professional including the use of images. Once someone has subscribed to your podcast, you need to keep giving them content or sooner or later they will throw you out of their feed reader (some readers even do this automatically if you don't keep on giving them new content), or just forget about you. Work out a way to have new content on a semi regular basis, or you've wasted all that energy you put into getting into their reader in the first place. Think of clever ways of making your podcasts more of a "teaser"
We went in boots and all and made pretty much all of WE05 available this year. Again, from a purely financial point of view, it might be better to only make some of them available, so people have just enough content to get them interested and talking, but enough missing to make them really think, "I have to be there next year". A conference is, we all know, so much more than hearing the presentations. Especially if you are ultimately going to make those presentations available for free, make sure that your event gives people that extra reason to actually be there. Maxine Sherrin is a director of Westciv as well as one of the organisers of the Web Essentials conference, held annually in Sydney Australia.